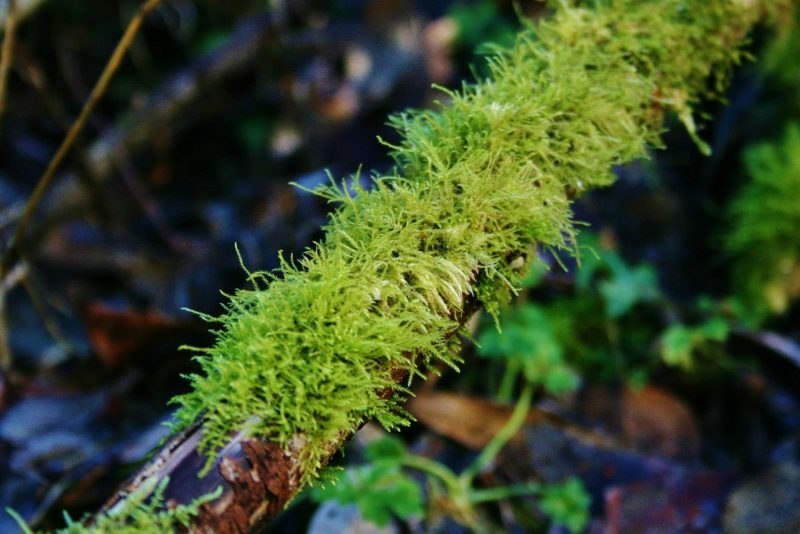 It’s hard to overstate the importance of nature. As much as we may try to separate ourselves from a connection with the natural world, life has a way of revealing our dependence on the flora and fauna, the vital oceans, the planets and stars. We fight so hard to tame and control and sanitize our lives, and we forget that it is in the wild abandon that we truly live. For us, nature became the home we lost when domestic violence infiltrated our lives. 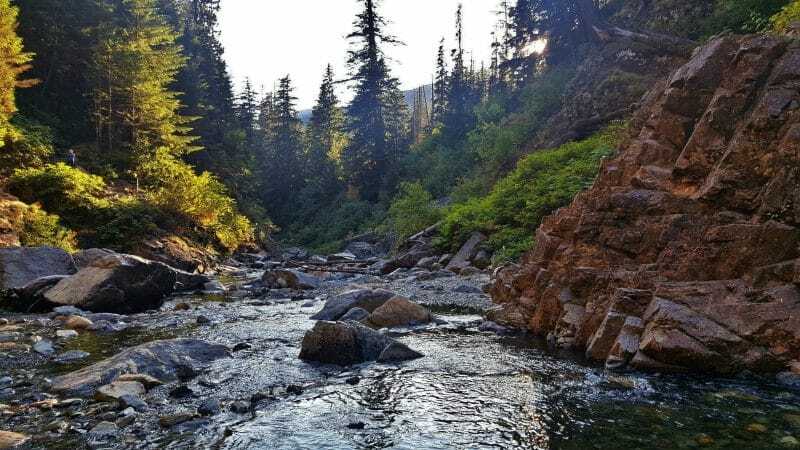 When systems failed to protect us, it was the comfort of the evergreens and the clear-flowing streams that welcomed us. It was the mountain sentinels who gave us strength and the ocean winds that gave us courage. It was the open spaces that granted us freedom and the understanding that our lives were sacred and worth fighting for. I say all this because sometimes it takes losing everything to know what’s really important – how many times have you heard that? 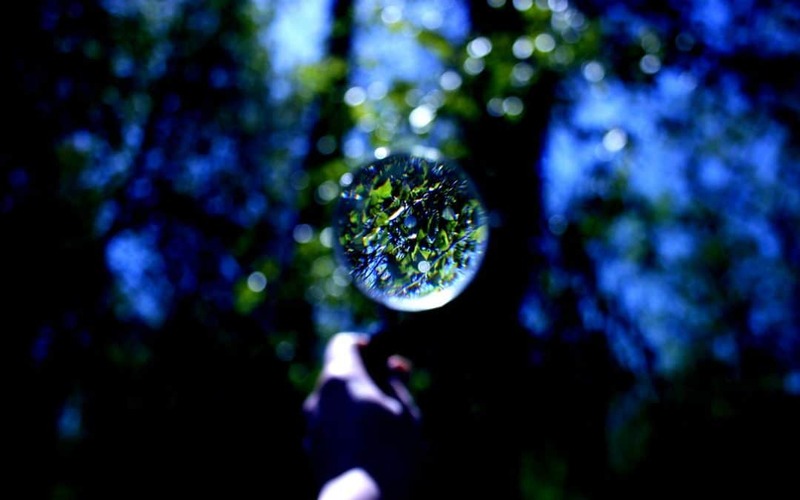 But more than that, losing everything made us realize that we were not apart from the natural world, but a part of it. And with gratitude, we feel compelled to do everything we can to protect it. It’s our home, after all. Our environment is under attack as never before. Politics aside, the fact remains that the future our national parks and monuments is threatened, strides in clean energy are being thwarted and assaults on pristine areas are increasing. There is power, of course, in every decision you make, from signing a petition and contacting your state and local representatives, to volunteering your time. But that can feel overwhelming to many, so what can you do, on your own, in your home, to make a difference (and make no mistake – you can make a difference!). For us, we wanted to show that apparel made with earth-friendly fabrics, in socially compliant facilities, are not only of superior softness and comfort, as well as just being less toxic to wear, but it also allows us to put some of those proceeds to work for environmental conservation. My next blog post will highlight why our eco-friendly apparel is a smart choice, but for now, what can you do at home, in your everyday life to lessen your impact on the planet? 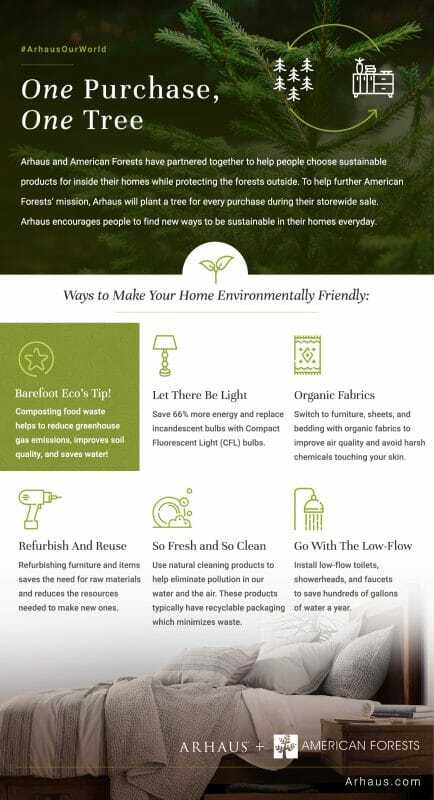 Our friends at Arhaus (https://www.arhaus.com), a company that is devoted to creating earth-friendly furniture from sustainable materials, created this helpful graphic to show some of the small changes you can make every day to have a big impact on the world around us, both today and in the future; you’ll even see a little tip on there from us! 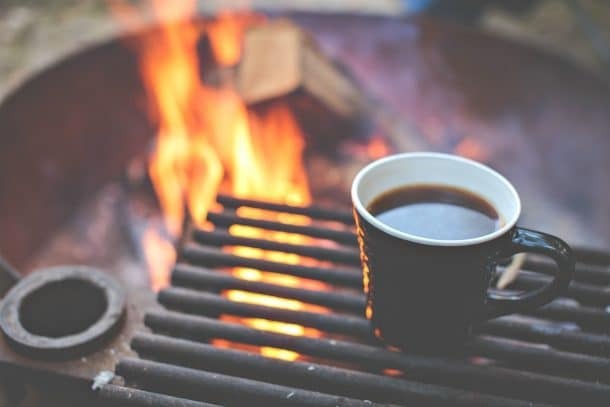 For example, Arhaus makes eco-friendly dining room and kitchen tables from reclaimed wood, and is partnering with the American Forests to plant a tree for every purchase made during their storewide sale. Furniture as a sustainable life choice is one that may have escaped your thinking, but it’s an obvious way to both beautify your house and create a home with unique stories to tell. We congratulate Arhaus on their commitment to sustainability, quality and environmental awareness! This infographic has it right. You may be married to your cleaning products, but there are many great natural choices now that are much healthier for you, and have much less negative impact. Light bulbs are an easy one! Yes, energy efficient bulbs may cost a bit more, but they last far longer, and your local energy company often offers free coupons or even replacements in some areas, which is worth checking out. New more efficient showerhead designs lessen the amount of water lost in the initial heating up process, which is also pretty cool, and an easy fix! 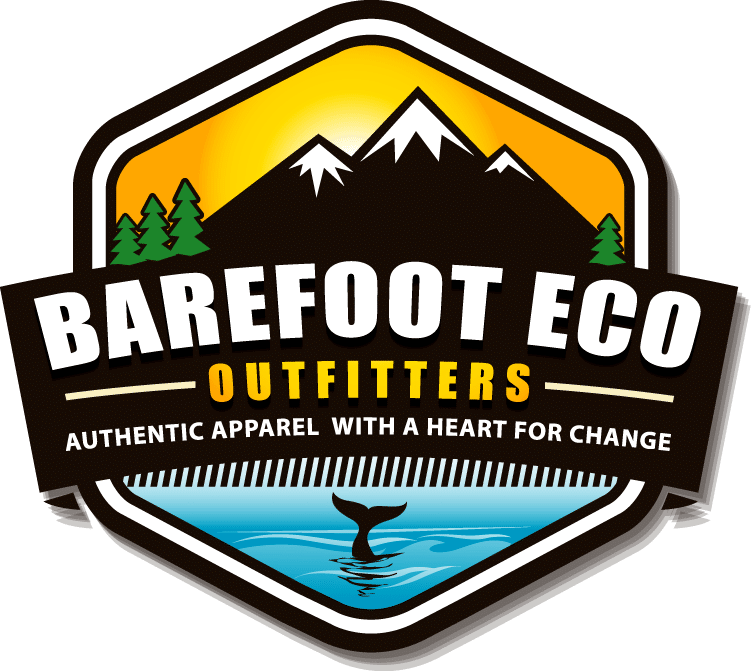 Since Barefoot Eco Outfitters obviously feels a strong connection to the earth, we are particularly fond of composting. No, that doesn’t mean you have to have a big barrel in the backyard to tend to (though that is kind of awesome); simply get a little bucket for under your sink, get a box of compostable kitchen bags from your local grocery store in the plastic bag section, and toss all your food waste in there! Many areas offer food/yard waste composting trash pickup options, but not everyone takes advantage of it. Try it for a week and see how much waste is actually organic material – it’s pretty impressive! And if that can go to enrich soil, reduce greenhouse gases and conserve water, that’s a win, win, win! These choices aren’t without consequence – they really do create a healthier environment for you and your family. Changes like these might feel overwhelming for you, so start with just one. We’re betting that there will be a certain amount of pride in that decision (even if your family complains at first! ), and we’re sure everyone will get on board when they realize that they do indeed have the power to impact the health of our planet. Yes, you! Inspire that in others! We need to work together to preserve what is most precious to us, and to protect both our houses, and our natural home.